These Africanized bees look exactly like normal bees but are fatal and are aggressive. They are responsible for hundreds of human deaths since there inception in 1950 in Brazil. In a tragic incident, a housekeeper, in her fifties was attacked by thousands of honey bees in California. The woman is presently hospitalized and is in a critical condition, the Orange County Fire Authority told to PEOPLE. This incident took place when a team of housekeeper reached their client’s house in Orange County- when one of the cleaners, named Maria went outside to get the mop from the vehicle. 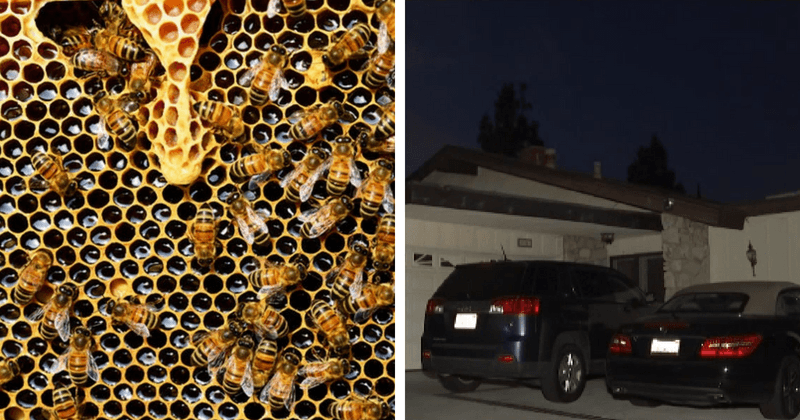 While she walked towards the car to fetch the mop, a flock of 30,000 to 80,000 Africanized honey bees also known as killer bees, that were concealed inside of a gas meter outside of the house, attacked her. This insect is expected to be present in America for over 20 years now. When these killer bees attacked Maria, she was left helpless and kept screaming in pain. Homeowner, Sara told ABC 7 that, “She was screaming, and I was telling her, ‘Move from the bees. Come over here, but she was covering her head.” During this haywire situation, everyone panicked and as a reflex, another housekeeper sprayed water on the bees, thinking that the bees might shoo away. However, the bees did not go away neither did they stop attacking her. In the meanwhile, Sara’s son called 911 for help, and by the time Orange County Fire Authority arrived, it was seen that Maria was completely covered with those killer bees. Because the situation was already intensely chaotic, the paramedics decided to let go their proper protocol, which includes covering the body with full body gear and taping over ever opening to protect themselves from the insects, and instead they launched themselves with all their focus on saving Maria. After escaping the flock of killer bees, Maria was taken in the ambulance to Saddleback Hospital in nearby Laguna Hills. Bommarito explained further, “There were still bees attached to her, “Bees were in the ambulance en route to the hospital, and bees that went into the emergency room with her.” Soon it was revealed by the doctors that, Maria was stung more than 200 times by those Africanized bees. The fighters who were involved in saving Maria were also stung by bees and got treated in the hospital. Fortunately, they were out of any danger and went back with their normal routine. However, Maria had been announced to be in a critical condition on the day she was stung by those bees, but now is expected to survive. https://t.co/VuQkEORFTJ What a harrowing story of a woman randomly attacked by a huge bee swarm. Makes me afraid to park my car. The captain of OFCA, Bommarito gave credits to the firefighters who jumped into that dire situation to save Maria without even thinking about their own life and safety.